Alexander Maksik’s ‘A Marker to Measure Drift’: a poetically powerful novel. 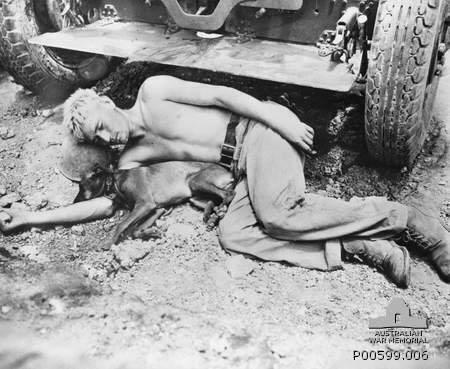 There are people amongst us, it’s true, who are forced to experience such unimaginable horror. Even though Australia isn’t completely free of horror, there are nations on the other side of the globe that have imploded – or that have been allowed to implode by a morally ineffective international community – and what these nations have had to endure is beyond the reach of our rational minds. 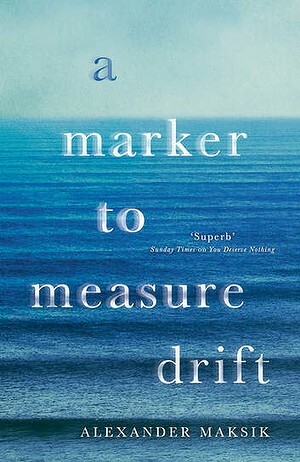 A New Yorker, though clearly well-travelled, Maksik’s novel A Marker to Measure Drift is a poetic, often mesmerising creation that carries the reader all the way to its horrific though inevitable conclusion. Some may ask questions about a Caucasian man telling an African woman’s story – and there is worth in asking these questions – but this novel is eminently readable, and should in fact be read by many, including those of us here who are able to live in blissful comfort at the bottom of the world. A Marker to Measure Drift concerns Jacqueline, a young Liberian woman who finds herself (loses herself?) on Santorini, the popular holiday island on the Aegean Sea. It is summer and the towns and villages are alive with tourists sunning themselves on idyllic beaches, swimming lazily in hotel pools, and enjoying sumptuous lunches and dinners. For those who can afford these luxuries it is paradise on Earth. Fittingly, cleverly, Maksik has chosen this place as Jacqueline’s refuge from her broken homeland – the island is highly volcanic and has tried to destroy itself more than once in the past. This used to be the centre of Minoan civilisation, now well and truly ancient history. Keep reading over at the Sydney Morning Herald. 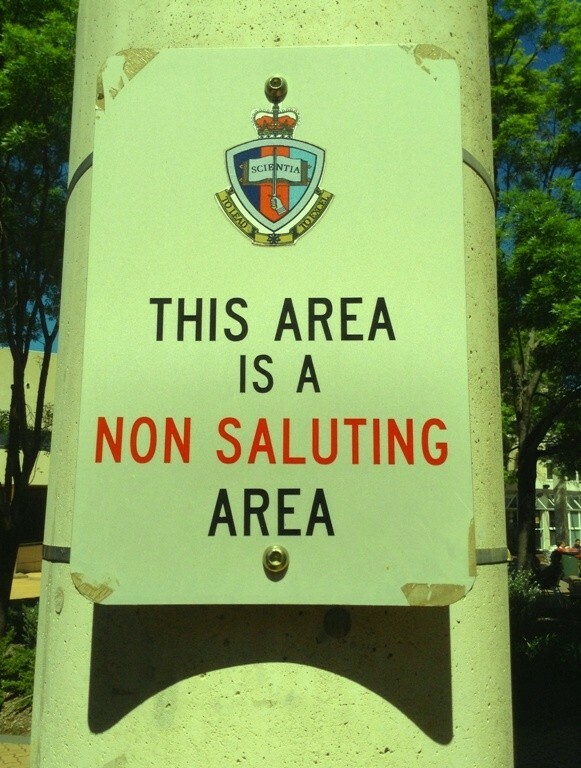 Originally commissioned by the Canberra Times and published on 12 October 2013. What is it, amongst everything we do, the working, the sleeping, the loving, the eating, and all the other things that come in – barge in – to fill our lives, that you’d consider being ‘the main game’? It’s not necessarily about priorities but how things are managed, sorted, contained, enlivened. For me, the main game is writing, which must come as no real surprise. But within writing, there’s a whole heap of activities: the forming of ideas, trying to tease out something that might be of value to someone else; and then there’s the editing, and editing, and editing, and the reading, and reading, and reading; and then, if a book is lucky enough to see the good light of day, there’s playing a role in the public process, the promotion, and whatever comes with that. None of this is meant to be a complaint. Rather, a lead-in to a rather special literary event that’s happening in Goulburn – yes, GOULBURN! – tomorrow, Sunday 20 October. It’s the very last of the events that have been held this year to celebrate the launch of The Invisible Thread, an anthology published by Halstead Press and edited by the amazingly hard-working Irma Gold that collects work by writers who’ve had an association with the ACT region (you’re right: yours truly is in it). Being someone who these days lives outside the city limits, I could see an opportunity to present the best of the writers from the anthology who now see ‘the country’ their home. So it’s amazing to have in one room for one afternoon Roger McDonald, Kim Mahood, Russell Erwin, and John Stokes, as well as Marion Halligan to draw us back to the very modern little city where all this started. 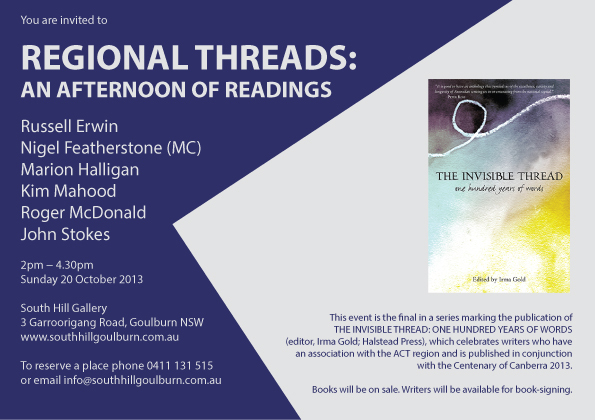 So if you’re fond of words – and to me THAT’s the main game – join us for Regional Threads: an afternoon of readings. It’s free, it’s in a terrific heritage-listed venue, and quite frankly it’s highly unlikely that we’ll ever again have such high-calibre writers like this together in one place in this neck of the woods. Seriously. You may have been in the presence of a writer – any kind of artist – during the moments after they’ve read a review of what they’ve created. If it’s a good review, as in the reviewer has come down on the side of the work, the producer of that work will be happier than they’ve ever felt before in their life, or so it feels at the time. If it’s a bad review, as in the reviewer has not come down on the side of the work, the producer of that work will be more miserable than they’ve ever felt before in their life, or so it feels at the time. Either way, however, why does it matter so much? Is it really that important? Shouldn’t the artist have sufficient confidence in their practice and work to enable a mature and reasonable response to a review, no matter what judgements and conclusions might have been made? And isn’t it true that the work is not the person behind it, that there’s a separation to be made? Isn’t this the best kind of protective mechanism? As someone who’s had their work reviewed – sometimes positively (every so often amazingly positively), sometimes nowhere near as positively as I’d dreamt – I do understand these things. Even if I wish I didn’t, that I was strong and big enough not to care. Perhaps all this matters because every artist simply wants a considered response, for it’s taken days and weeks and months and years, sometimes decades, to create something they consider worthwhile. It is wonderful when family and friends and sympathetic others say they enjoyed the work, that they were moved, that it ended up meaning a lot to them. But there’s that other kind of response, from someone whose job it is to consider context, goals and ambition, technique, and ultimately make some kind of evaluation of worth against the broader cultural register. An authority, an expert has given the work a close reading, and a pronouncement has been made. It would be difficult to find an artist who didn’t appreciate this kind of response to what they’ve created, even if they’d like to suggest otherwise. All these questions and issues will be discussed on Friday 18 October 2013 at a forum organised by the Childers Group, an arts advocacy body for the ACT region (and beyond). The forum, which is better described as a ‘Q and A-style’ panel discussion, will include participation from Centenary of Canberra Creative Director Robyn Archer, Chief Executive Officer of Ausdance National Roslyn Dundas, eminent author Marion Halligan, Artistic Director/CEO of the Street Theatre Caroline Stacey, longtime Canberra Times stalwart Jack Waterford, and Editor of BMA Magazine Ashley Thomson, amongst others. If you’re in or near this neck of the woods, and you’re worried about what’s perceived to be fewer opportunities for truly independent and robust review (the sort that is beyond simply online opinion), then you may well want to drop in and get involved. For more information, head on over to the Childers Group website. Here endeth the community service announcement. And if you hadn’t already gathered, I’m a member of the Childers Group. A foundation member even. Never imagined that I’d be a foundation member of anything. Other than Melancholics Anonymous.